Murdo, SD - Every year, during the third weekend of August, over 200 of the most prized collector cars and motorcycles in the world enter onto what is often called the best finishing hole in golf — the famed eighteenth fairway at Pebble Beach Golf Resort in Pebble Beach, California. 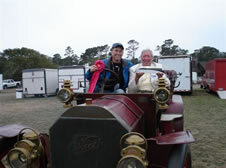 South Dakota was represented, and did not disappoint by taking 2nd place in Class L-1 (Prewar Preservation) with the 1905 Fiat 60 HP Quimby Touring, entered by David Geisler Sr. of Pioneer Auto Show, Murdo, SD. This show is special, as cars and motorcycles are judged on style, historical accuracy, and their technical merit - with participation by invite only. Concours D' Elegance translates as an automotive contest of elegance. To compete in the Pebble Beach Concours D’Elegance an automobile must be a well preserved or accurately restored vehicle still quite capable of being driven. It will almost surely have some historic value—perhaps it served to debut new technology or new styling trends or it has an impressive racing record. And it will be rare—possibly a singular example of a special chassis bearing a respected coachbuilder’s art. 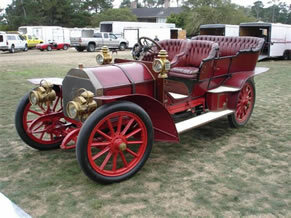 Dave Geisler Sr., owner of Pioneer Auto Show, said "The 1905 Fiat definitely fits the profile for this show. Of only twenty of its kind built, it is believed to be the last one in existence." The Fiat was originally built as a high performance car specifically for the ultra-rich to drive fast on public roads, and by verbal history this particular car is believed to have been owned by the eclectic brewing tycoon August Anheuser Busch, Sr.
"We are thrilled to have earned recognition at Pebble Beach," said Geisler. "The car will next be featured in the lobby at the new LeMay Museum in Tacoma, WA. As one of the world's largest auto museums and attractions, this four story museum houses up to 350 cars, trucks and motorcycles." The historic automobile will then make its way back to its current home, the Pioneer Auto Museum in Murdo, South Dakota. Here it will remain for automobile enthusiasts across America to admire the one of a kind car when they travel to South Dakota. To learn more about this spectacular and rare automobile or to see how Pioneer Auto in Murdo celebrates and preserves the automotive culture, call 605-669-2691 Murdo, SD - Every year, during the third weekend of August, over 200 of the most prized collector cars and motorcycles in the world enter onto what is often called the best finishing hole in golf — the famed eighteenth fairway at Pebble Beach Golf Resort in Pebble Beach, California.